Alone in Alaska's Wilderness, three Eastern Bowhunters learn about survival, fear, and friendship. There was no mistaking it! The dull scraping noise echoed through the stillness of the forest. Pinpointing the direction of the sound, I moved quietly on the moist ground toward the bull. At nearly a hundred yards, I dropped to my knees and listened. "No way he heard me, and the wind's right" I said to myself while dropping my binoculars and pack. I Raked my longbow against the bark of a spruce then paused for a response. Still nothing! 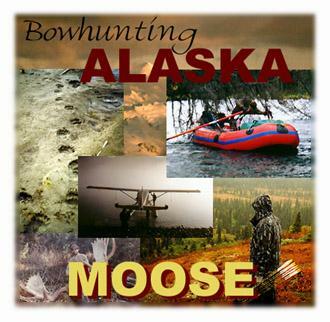 An animal as big as an Alaskan bull moose can disappear like a cloud. I'd watched one a week ago vanish into dense willows...without a sound! But I sensed otherwise with this bull. He was still around. I had just dropped my bow when I heard a faint sound. My pulse quickened. It was a grunting bull! I cupped my hand to my ear but the grunting stopped! With the exception of the rain dripping from wet spruce boughs, the woods were quiet. He was testing me; trying to see how serious a challenge I was. I needed to prove myself a threat-and make him mad! I must have looked insane! Like a seven year old, I hung from branches until they cracked off the tree. Kicking dead limbs then dragging my longbow up and down against its bark; I tried to make as much noise as possible. I was going to tick that bull off...and I did! From within the spruce swamp I heard the snapping of tree limbs as he charged. The sound of his breathing, deep and excited, made me tremble. 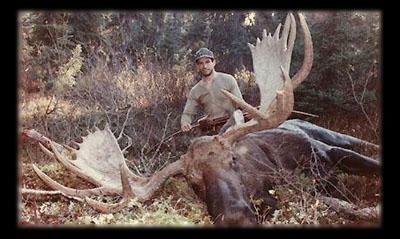 Moose have attacked men before, especially in the rut, and this bull was rutting hard! Fifty yards away and coming fast, I saw movement. He stopped just inside the swamp. I squeezed the handle of my longbow...anticipating a shot. He stepped out slowly through the dense trees and I stopped breathing! I had seen many moose, but none compared to him. My trembling turned into uncontrollable shakes. The bull began slamming his massive antlers into a dead spruce; shattering the dried branches like glass. He was a mere twenty-five paces away. I tried to regain my composure but it was no use. Slowly posturing, he dipped his massive rack from side to side. "Concentrate, pick a spot"! I said to myself as he walked closer. If he continued on his course for another twenty yards he'd crush me. A straight-on shoulder shot is out of the question for any type of bow; especially my homemade longbow. He'd have to be quartering away. He then stopped to test the wind. "Calm down, get a grip"! I said to myself. But I couldn't. He was too close; too big! He started walking toward me again. At fifteen yards and closing, I wanted to flee. Another foot closer, I'd have to throw myself out of his way. At the last second; he turned to avoid the little spruce I crouched behind. In one motion, I drew and shot. My handmade wood arrow sunk up to the white feathers in the bull's side. As the bull crashed off toward the meadow, I collapsed to the ground and took a deep breath. I knew the shot was perfect. He would not go far. I noted the direction of the bull and checked the time. It would be the longest hour of my life but I forced myself to wait it out. 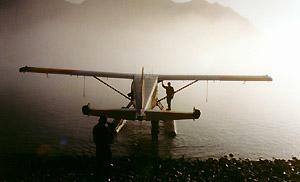 The Float Plane landed in the fog, we unloaded the gear and waved goodbye - we were now on our own for two weeks. Typical Moose Country, This moose (on the opposite shore) fed on grasses just a few hundred yards from our first campsite. Ten days ago, Dave Corbet, Charlie Rehor and I began our float trip on a remote Alaskan lake. We had two weeks to float the Chilikadrotna and Mulchatna rivers until our outfitter, High Adventure Air Charters, would rendezvous with us at Dead Man's Creek. 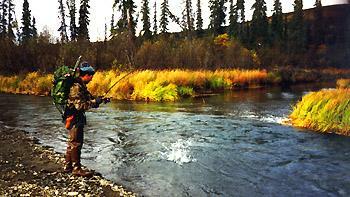 For a week and a half, we fished and bowhunted over a hundred miles of Alaskan River. All three of us had stalks on bull moose, but for one reason or another, couldn't get close enough for a shot. Charlie navigating through a sweeper, these occurences were common on the Mulchatna and Chilikadrotna Rivers. We found this area by accident. We loaded up the boats on the eighth day of our hunt and headed for the junction of the Mulchatna and Chilikadrotna Rivers. After floating for hours, we soon realized that we had missed the junction and were now only fifteen miles from our pickup spot. After finding a suitable campsite, we pulled off the river and raced against daylight to set up camp. The campsite was perfect except for a worn bear trail, following the river like a sidewalk, and the Salmon remains which littered it along the way. This was a favorite fishing spot for the local brown bears but having camped on bear trails before, we never gave it a second thought. Glancing down at my watch for the twentieth time, it was now forty five minutes after my arrow had found it's mark. I grabbed my pack and binoculars and took up the trail. An hour later I was standing over my bull. His antlers were nearly as wide as my longbow. I couldn't even lift his head off the ground. I would need help. After flagging a trail to my moose, I headed back to camp. When I told Dave and Charlie the story, they were ecstatic and eager to see the moose. "God bless you Patrick" Charlie said at the first sight of my bull. Dave just chuckled and said "Oh boy...Oh boy." We rolled up our sleeves and got down to business. At ten thirty, we had finished caping, quartering, and butchering. By the next day, the moose was back in camp. It had been a backbreaking two days. After a feast of moose and fried rainbow, Dave and Charlie retired to the tent. I was grateful for all their help. With only one day left to hunt, it didn't look as if they would harvest an animal on this trip. One Arrow through the lungs at 8 yards, what a thrill! The next morning, I cleaned up the meat, and placed it in bags. After constructing a meatpole thirty yards from the tent, I hung the meat and cape on it to cool. Charlie had returned early from hunting and asked me if I could pry myself away from the moose and do some fishing. 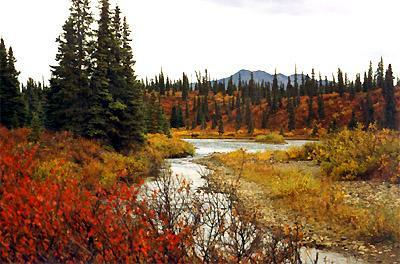 Without hesitation, I grabbed the poles and headed up river on one of the many beaten-down bear paths. Within minutes Charlie was reeling in a four pound rainbow. I waded across a small stream to a sandbar to video Charlie landing his trout. 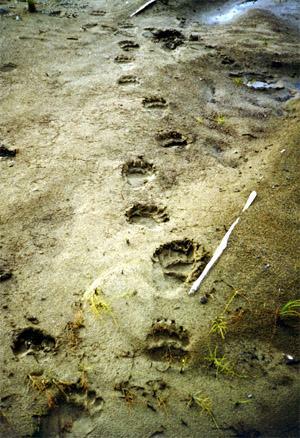 The sandbar was covered with fresh tracks of a large brown bear...just forty yards upstream from camp! I called Charlie over and we both agreed a bear was here the previous night. "Don't worry about it," I said to Charlie, "he won't want any moose with all that salmon around, besides, he's more afraid of us than we are of him." We continued upstream but I looked back at the tracks and felt uneasy. I shrugged it off and began fishing for salmon. That night, I lay in my sleeping bag listening to the river. Charlie and Dave had been snoring for hours but I was too nervous to sleep; thinking about the bear tracks. I illuminated the dial on my watch. "Two in the morning? I have to get some sleep"! Flipping over in my sleeping bag, I could see the light of the moon casting a gentle glow on the nylon wall of the tent. I thought about the last few days, the excitement of the moose hunt, and the friendship we had formed through hunting. I didn't want to leave. In just two more days, we'd be back home. I nodded off for a half hour until the sound of a salmon splashing in the river startled me. My heart skipped two beats and I was again...wide awake. The wind had picked up causing the nylon fabric of the tent wall to hit me in the face. Dave and Charlie were still snoring. I tried not to wake them as I reached for my shotgun and laid it next to me. Although none of us were hunting with guns, we brought them as a precaution. Lying back down in my sleeping bag, I illuminated my watch dial again. "Darn...now it's Three in the morning!" I said to myself as I concentrated on even the faintest sound outside the tent. My eyes grew tired again and I had just started to nod off when I heard a thump. Having listened to every imaginable sound; this was out of the ordinary. Then I heard another thump and another and another! There was something coming toward the tent. It was a brown bear! "Stay calm, he'll leave once he gets a good whiff of us" I said to myself as my heart raced. But he didn't. I shook uncontrollably when the thumps stopped. He was right outside the tent! "Brown bears fear humans" I said defiantly as I began to see his shadow becoming more defined on the tent wall...three feet away! I clicked off the safety of my gun. I was terrified! At two feet from the tent, I heard him breathing. He came closer. I started to panic. "Oh Man, I can smell him!" I said to myself. I prayed for Dave and Charlie to stop snoring. "He's going to attack! Why else would he be this close"? I lifted the barrel of the gun, now inches from his nose. My finger gently squeezed the trigger but I couldn't shoot. He just stood there. Then, in a moment, he disappeared. I quickly flipped around in my sleeping bag and sunk my fingers into Charlie's arm. "There's a bear in camp!" Charlie and Dave dashed for their pistols. As if someone had jumped their hearts with a car battery, they were wide awake in a second. Talking at a hundred miles an hour, I recounted the events of the last minute. "Now what do we do?" Charlie said. "We have to get him away from the meat" I responded. "I'll unzip the tent window and shoot into the air. When we're satisfied that he's gone, we'll go outside and check on the meat." We all knew if the bear had gotten any of that moose, we'd be in big trouble! Pointing to where the bear was standing when he pushed his nose into the tent wall. The shotgun blast pierced the silence of the night. After our ears stopped ringing, we listened for the bear. After minutes of silence, we were sure the bear had left. Armed with firearms and flashlights, and wearing nothing but our underwear and hunting boots, we cautiously exited the tent. Easing our way down the trail to the meat pole, we scanned the darkness in all directions with our flashlights. I walked up to the meatpole and stopped suddenly. Turning to Charlie, I whispered: "It's all gone"! The hair on the back of Charlie's neck stood up as we both realized the danger of the situation. The bear had taken seven hundred pounds of meat and the entire cape. He could not go far with it and that could only mean one thing...He was not going anywhere! We made a beeline for the tent. Twenty minutes later the sound of thumping was outside our tent again. The bear was back! After shouting our lungs out, all turned silent. We knew the bear was still around so we didn't dare leave the tent. An hour later, we heard pans banging around by the fire. "What more does he want? He already has seven hundred pounds of meat and my cape"! I said nervously. We shouted again, but this time, he didn't run off. "That's it" I said unzipping the tent window. I pointed my shotgun in the air over the bear's head and shot. He ran into the swamp and never returned. Morning came slowly. Exhausted from our ordeal, we cautiously exited the tent and began searching the area. We were able to recover an entire front shoulder, all the neck, brisket, rib and tenderloin cuts, and luckily the cape. The two hindquarters and one shoulder were never found. We didn't waste any time getting out of there. While Dave and Charlie broke camp, I washed off the meat. A half hour later we were in our rafts for the fifteen mile float to our pickup spot. As our campsite on the bank grew more distant, I lay back in the raft and ran through the events of the evening. We had made many mistakes. We would know better the next time we were in Alaska. Forty-eight hours later, we were sharing our memories over a beer in the Anchorage airport. We toasted my moose, our friendship and the bear that would change us forever. I walked Dave and Charlie to the gate, and, with a quick embrace, said good-bye to my two companions. On my way back I noticed a group of hunters waiting for a porter. "You going moose hunting?" I said to the taller of the three. "Yea, and caribou" he replied. "Well, just be careful with the brownies up here, they can be pretty brave" I said as I turned and walked away. His reply sounded familiar; "Heck, we ain't afraid of no bears." A smile grew across my face as I turned to him and said, "Where have I heard that before?" 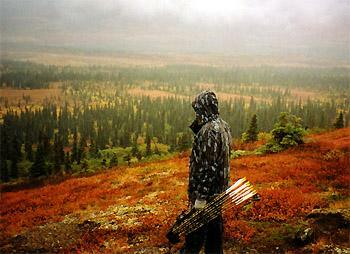 The Sheer beauty of the Alaskan wilderness is something that every bowhunter should experience at least once. Above, a vibrant rainbow marks the end of a September shower, below, Mount Mckinley is clearly visible from our floatplane. The Alaskan Moose is one BIG animal. A trophy moose can go eighteen hundred pounds and stand nine feet at the shoulder. Heavy bows and heavy arrows are a must! For my hunt I used my homemade Black Walnut Lonbow which pulled sixty-five pounds at my draw length of twenty six inches. Heavy arrows are key to good penetration and are much more critical than speed for an animal as big as a moose. For my arrows I used a special hardwood arrow material called RAMINWOOD which, along with my Zwickey Delta broadheads, produced a finished arrow of eight hundred grains. Though my sixty-five pound longbow sent those arrows a sizzling one hundred-fifteen feet per second through a chronograph, the arrow penetrated completely through the Moose! Arrow and bow weights are not nearly as critical as shot placement however, and nothing other than a quartering away, or broadside shot is recommended. My bull stood in front of me at twenty yards with a very slight quartering-to angle. Although I felt confident that I could slip the arrow into the right spot, there was too much chance of a wound. The moose ended up walking past me at eight yards, giving me a perfect quartering-away shot. I recovered the bull in less than one hundred yards with a single clean shot. A two week float trip requires you to be mobile. The old adage of travel light and bring everything you need says it all. Our first trip to Alaska would have been more enjoyable had we not brought everything but the kitchen sink! In addition to having too much gear, we decided to go unguided rather than outfitted. 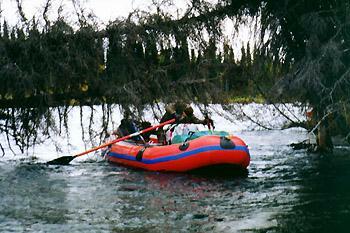 We rented two rafts from a flying service and, after landing eighty miles from our pickup spot and waving good-bye to our pilot, we unfolded our rafts to find out that one raft had the bottom floor rotted out. It was a very cold and wet float for three weeks above the Arctic circle. After that incident we made up our minds to go outfitted. We contacted a number of outfitters that serviced the GMU's we wanted to hunt. We narrowed it down to High Adventure Air Charters, a family run business out of Soldotna, Alaska (907-262-5237) who impressed us with their knowledge of the area, high quality rafts and camping supplies, and overall flying operation. Greg and Mark Bell run a unique type of outfitting and guiding operation which caters to personal service and homestyle accommodations. When we arrived in Soldotna, we stayed in a comfortable log cabin, enjoyed a home cooked breakfast, and left on time (which is not always the case in Alaska). The outfitter provided us with two high quality rafts with rowing frames (which is an absolute necessity), coolers, cooking stoves and gas, a high quality tent, and topographic maps of the areas we hunted. The weather in Alaska is seldom pleasant, but it can be comfortable if you prepare for it. 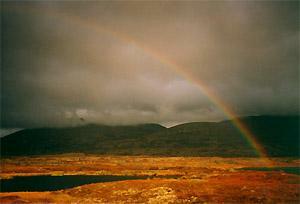 We had rain every day but most of the time it was just a passing shower and my gore-tex/wool clothing was sufficient. In case of heavy rains, I had a lightweight PVC suit folded up in my backpack. Ankle fit hip boots are necessary as are a good pair of worn-in hunting boots. On an average hunt like this you can expect to walk from ten to twenty miles a day. Although we were floating; trophy moose rarely hang around the river banks and you have to get away from the river and up into the hills to find them.